Yeah you read that right - these balls have shrooms in them. Mushrooms have been GAME CHANGING for me, I take them every single day - usually multiple times a day because I have so many different types. There is literally a mushroom for every ailment, issue, stress and condition so if you're new to shrooms it can be a little bit overwhelming to say the least. I used Four Sigmatic's Superfood Mushroom Blend in this recipe and I honestly thing that it is the perfect place to start if you're wanting to jump into the mushroom world. It contains 10 powerful body and mind defending mushrooms like chaga, lion's mane, reishi, and cordyceps and so many more so it is absolutely perfect for beginners! Mushrooms can be a little bitter so they're really good paired with more bitter foods like coffee or cacao (aka chocolate) - these balls completely disguise the shroom taste to the point where you can't even tell that they're in them! 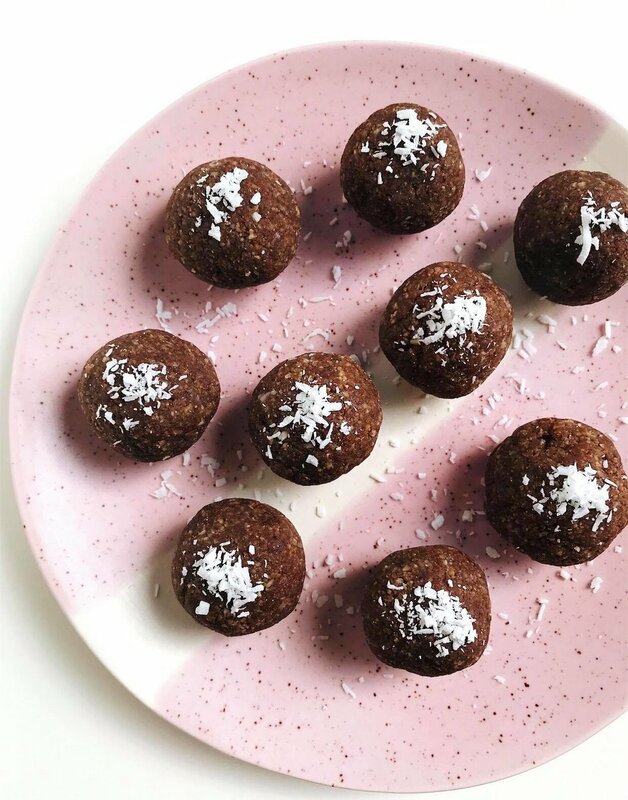 They're dense, rich, chocolatey, high in healthy fats and protein and DAMN GOOD - and I'm not even being biased, they're so legit - you need these in your life! 1. Add all dry ingredients into a food processor and blend until combined, then slowly add in wet ingredients until desired consistency is formed - should be thick but workable. 2. Roll into balls and sprinkle with more coconut. 3. Store in the fridge for up to 10 days.